Keep reading (or skimming) and be rewarded. Our winning Watermelon and Goat Cheese Salad with Rosemary. Not bad for thrown together, Iron Chef style. I started Fancy Pants Foodie about three years ago now, with the original intent of showing you peoples how to make some upscale food, fairly easily, at home. Having had the journalism bug (and degree) as well, the blog soon included coverage of food events, new restaurants and stores, chefs and other food-related news. Sometimes the voice I used in these didn’t exactly match the one I used for recipes and instructional posts. Still doesn’t. One day you get snarky and fun, and the next you get inverted-pyramid-style straight journalism. At the recent Arkansas Women Bloggers Unplugged conference, voice was an issue of conversation. Yeah, we needed to clarify our purpose, and then our voice. But what if we’re a little bipolar in what our blog does, like me? What’s the purpose of this blog thing, anyway? I’m very humbled and honored to say that this humble space has received a lot of love over the past three years. This is despite the redesign and site upgrade that I’ve threatened now for two years and still haven’t accomplished. The theme you see here (if you’re reading before said upgrade happens) is the one I randomly chose in the middle of the night when I decided to pull a blog out of my rear. At the conference, and even more so after, I had to really think about what I’m doing in this space. I write the blog to teach people how to cook from a semi-pro perspective, especially upscale things that may be new to them. I also tell people about food news that’s going on in Arkansas. And occasionally, I use the blog to inspire people to participate in food-related things that are bigger than themselves, or just to mess around and have fun. So, if you’re counting, that’s at least three different blogs. All run together. No more straight-faced journalism pieces. I’ll save those for any outside writing gigs that use that sort of style. Even for newsy pieces like chef interviews or openings, my natural snark and wit are going to appear if it kills me. This is a blog, not a newspaper, for crying out loud. A blog redesign is urgent, and will include categories separating the major styles and topics of the blog. I’m thinking “Recipes,” “News & Events” and “Features,” plus a category for outside work I’d like to do. Or something like that. Opening clips of all the stories will flow on the front page, though. Write more freely. I tend to overthink and thereby not post as often as I should. The more I write, the more other good things happen. Work on developing more of a community of Arkansas food people, specifically those who want to learn more about upscale cooking at home or professionally. I get traffic from all over the world, but I’d love for more of that to come from right here in our state, and for those who visit to join me in conversation. Other bloggers have recapped the details of our conference pretty well, so I don’t feel obligated to fill you in on every little thing. But, of course, the highlight for me was Foodie Friday, completely dedicated to food-related blog love, orchestrated by the fab Lyndi of NWAFoodie. And the best part of Foodie Friday? Iron Chef. No lie. After some brainstorming, sensory and other writing exercises, we were assigned a group and were placed into the hands of Tina Marie Wilcox, the “Herb Lady” at the Ozark Folk Center. Of course, I bounced in my seat when this activity was announced. By the way, we’d be feeding all the other AWBU attendees who were showing up for a reception. With OUR food. Our team was assigned its herb: Rosemary. Walkthrough of a room filled with random available ingredients. GO. We ended up making a sautéed mushroom and herb bruschetta that wasn’t my favorite ever, due to minimal of access to the toaster oven, as well as a stellar rosemary & berry lemonade created by fellow food blogger Kat Robinson. But the winner-winner-herbal-dinner was our watermelon salad with goat cheese and a red wine vinaigrette. With rosemary. Fo reals. We won the “Best Use of Herbs” category by judges from the local Anglers restaurant. I’m sure I’ll write further about the conference, so stay tuned for more details, foodie and otherwise. Meanwhile, find one of the last Arkansas watermelons and make this! Cut a very thin slice off one side of the watermelon, not cutting into the flesh, to create a stable bowl. If you’re chicken, or you just forget like I did, just place the watermelon on a towel to keep it stable. Cut the watermelon in half, keeping your slice in the center of the half you plan to use as a bowl. In a separate bowl, whisk together the red wine vinegar and olive oil, salt and pepper. Pour over the watermelon mixture and gently toss. Note: If you’re using the goat cheese, it will melt and get oozy. It’s what we had available. Go with it. If I were doing this at home, I’d probably go with feta, which has a known relationship with watermelon in some circles. 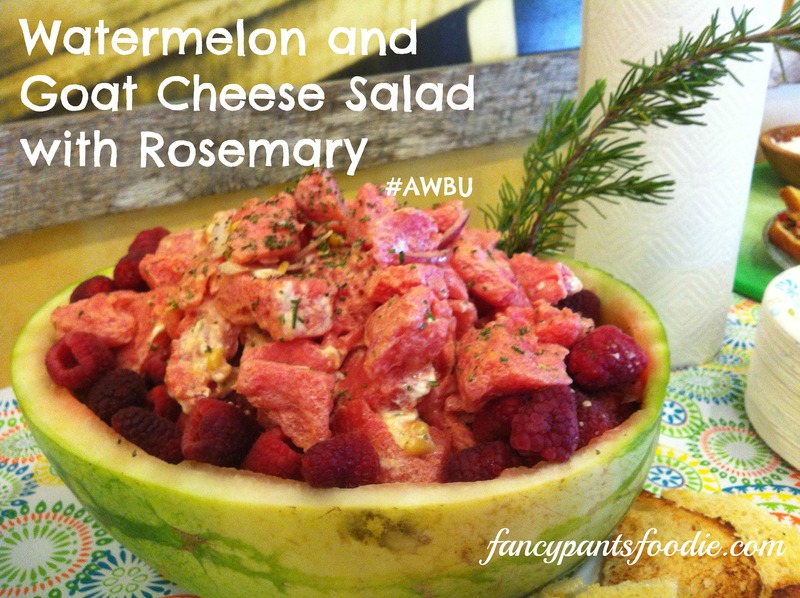 Fill the chosen watermelon rind with your finished salad, and sprinkle the remaining rosemary on top. Garnish the edges of the bowl with the berries, and place a sprig or two of whole rosemary in the side so folks know what’s in it. Oh, I'm so glad you posted that recipe! That watermelon was my favorite dish and I can't wait to try it myself. Thanks! Awesome! I can't believe you made it all the way through that long post! :) Glad you liked the dish.